The actor has been put forward for several dubious honors at the ceremony, which celebrates the worst films of the past year in a spoof to the Oscars. His nominations include Worst Actor for both 'Jack and Jill' and 'Just Go with It' - and Worst Actress for 'Jack and Jill' in which he plays a family man and his own twin sister. He also has two nominations as Worst Screen Couple opposite Jennifer Aniston or Brooklyn Decker in 'Just Go with It' and opposite Katie Holmes, Al Pacino or himself in 'Jack and Jill'. 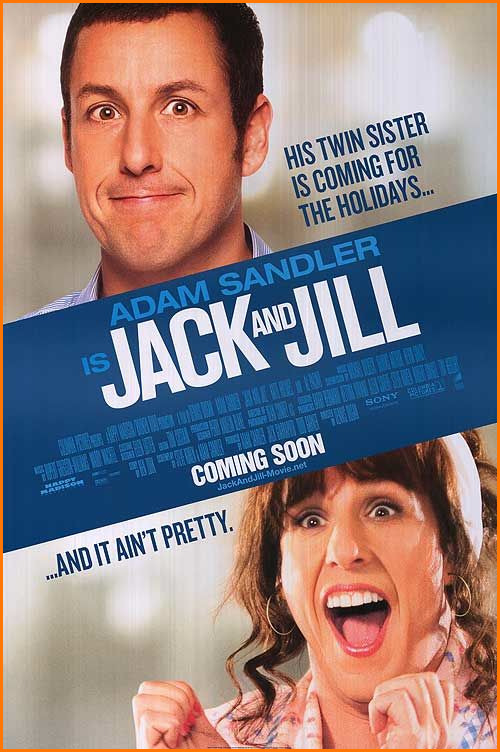 After being a producer on 'Bucky Larson' and 'Jack and Jill', Sandler received nods in the Worst Picture and Worst Prequel, Remake, Rip-off or Sequel categories. He also got Worst-Screenplay nominations as a writer on both movies, and a Worst Ensemble nomination for 'Jack and Jill'. Razzies founder John Wilson said: "It's almost karmic for someone to have made that much razz-able stuff in one year. He has angered someone really powerful, I would say." The awards are normally held the night before the Oscars - which take place 26th February - but organizers have now moved them to April 1 as they think April Fool's Day is the ideal time to have them. Wilson said: "I have always wondered if we stepped slightly away from lockstep with the Oscars, what would happen. We just kept hoping the Oscars would do their ceremony on April 2, but they just never did." Other nominees include 'New Year's Eve', 'Transformers: Dark of the Moon', The Twilight Saga: Breaking Dawn, Part 1', Nicole Kidman, Robert Pattinson and Kristen Stewart. Ken Jeong for four movies - 'Big Mommas','The Hangover: Part II', 'Transformers' & 'Zookeeper'. Nicholas Cage & "anyone sharing the screen with him in any of his three 2011 films"